A monument commemorates Mustafa Kemal Ataturk and also the heroism and self-sacrifice of both the ANZAC and Turkish troops that took part in the Gallipoli campaign in 1915 during World War One. 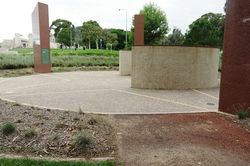 The memorial consists of a crescent-shaped wall on a circular paved area. The form of the wall reflects the crescent and five-pointed star of the Turkish flag. At the centre of the memorial, placed in a time capsule, is soil from the battlefields of Gallipoli. Centrally located on the wall is a bronze likeness of Ataturk a gift of the Turkish government. The inscription beneath - Ataturk`s own words - pays warm tribute to the ANZACs and reflects his understanding of the awful cost of war. Surrounding the memorial are pine trees, Pinus halepensis, grown from seed collected from the Gallipoli `lone pine`. Lieutenant Colonel Mustafa Kemal (1881-1938) commander of the 19th Infantry Division, led the Turkish troops who resisted the ANZAC soldiers advancing from the Ari Burnu landings at Gallipoli during World War One. As the founder and first President of modern Turkey, Mustafa Kemal Ataturk is regarded as `the father of the nation`. Lieutenant Colonel Mustafa Kemal (1881-1938) commander of the 19th Infantry Division , led the Turkish Troops who resisted the ANZAC soldiers advancing from the Ari Burnu landings at Gallipoli. As the founder and first president of modern Turkey, Mustafa Kemal Ataturk is regarded as 'the father of the nation'. This memorial designed by architectural firm PDCM Pty. Ltd, honours Kemal Ataturk and also the heroism and self- sacrifice of both the ANZAC and Turkish troops taking part in that bitterly fought campaign. 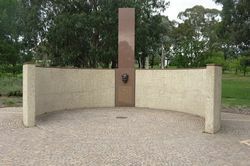 The memorial consists of a crescent-shaped wall on a circular paved area. The form of the wall reflects the crescent and five-pointed star of the Turkish flag. At the centre of the memorial, placed in a time capsule, is soil from the battlefields of Gallipoli. Soil from ANZAC Cove, Turkey, was placed beneath this plaque at the commemoration of this memorial on 25 April 1985, the 70th anniversary of the landing at Gallipoli, by His Excellency Mr. Vahit Halefoglu, Minister for Foreign Affairs of the Republic of Turkey in the presence of the Honourable Gordon Scholes, Minister for Territories and acting Minister for Veterans` Affairs of the Commonwealth of Australia and the Honourable Frank O`Flynn, Minister for Defence and Associate Minister for Foreign Affairs, New Zealand.